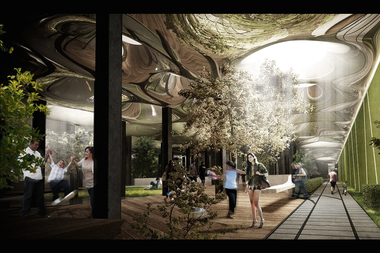 A rendering of the proposed Lowline subterranean park on the Lower East Side. LOWER EAST SIDE — As the impending L train closure draws closer, communities that live and work along the line are grasping for ways to mitigate the loss, begging city and transit agencies to facilitate more transit service elsewhere. During a public meeting between the MTA and Community Board 3, residents pitched ideas for ways to cope without the L train, including more bike lanes, bus service, and taking the site targeted for an underground park project and putting it to work as a transportation hub instead. Transforming the old trolley station under Delancey Street near Essex Street — the same underground station slated for the Lowline — could help boost service for the B39 bus, which carries riders between Williamsburg and the Lower East Side, said Tunisia Riley of the board's land use committee. Residents said they were concerned that the B39 bus, as well as the M and J train would be overridden with commuters in need of an alternative to the L.
"I'm worried that now the L train is going to be gone, we're going to be having more people using our transportation, which is already limited," said Tunisia Riley of the board's land use committee. MTA officials in attendance at the meeting said they'd consider the idea. "We're taking every idea and looking at it...It's certainly something that, if it would make sense somehow and we can get the buses in, it might make sense to look at it, so we'll probably take a look at it," said Peter Cafiero, the MTA's Head of Operations. Cafiero also added that the agency plans to "more than double" bus service on the Lower East Side, including the B39, the M14a and M14d — in part, to alleviate the increased ridership of the M and J lines the MTA is anticipating while the L is out of service. "A B39 on steroids will essentially be needed," he said. As large developments promise to bring thousands of new residents to the Lower East Side in the coming years — Essex Crossing alone will hold 1,000 new units — Riley worries that the neighborhood's existing infrastructure will struggle to accommodate the swelling numbers. She also pointed out that the team behind the prospective Lowline project has not yet locked down the trolley station — the city's Economic Development Corporation last year issued a request for expressions of interest (RFEI) and is still reviewing proposals for the site. Though Community Board 3 endorsed the Lowline pitch in 2013, community members have since criticized the project for a lack of community engagement — a critique the team is addressing by forming a "Community Engagement Committee." When asked whether the EDC — which is developing the site in conjunction with the MTA — is considering proposals to reactivate the site as a transit hub, a rep did not immediately respond. Meanwhile, a rep for the Lowline team said Riley's pitch would never work because the terminal was "never configured for bus storage." "Not only would it be technically not feasible to use the space as a bus depot, but it would be disappointing to suffer such a poor lack of imagination as to use the historic one-acre site as a parking lot," said co-founder Dan Barasch. The Department of Transportation declined to comment on the feasibility of using the site as a transit hub. In addition to increasing bus service, cyclists are pushing for better biking accommodations during the shutdown — reps for Transportation Alternative, a group advocating for cyclists and pedestrians, have pitched a plan that would turn 14th Street into a "PeopleWay" for the duration of the closure, re-routing private vehicles and allowing only buses, bikes and pedestrians along the corridor between First and Eighth avenues. "The thing about taking the L train offline is there's going to be so much more pressure on the streets, and bikes don't require a lot of infrastructure but they help a lot of people," said TransAlt member Melanie Bryant. The MTA and DOT are together exploring ways to better accommodate bikers during the closure, said Cafiero. The MTA is currently exploring two options for an extended L train shutdown, which the agency says is necessary to repair damage to the Canarsie Tubes from Hurricane Sandy. The authority will either shut down all L train service for 18 months or shut down one tunnel at a time for three years — a decision will be made by August of this year, officials said. The shutdown will commence in 2019.